In 2016 the Dongshi District Household Registration Office of Taichung, Taiwan, chose a very interesting method to reserve house numbers in the Zao Keng valley of Qingfu Village. 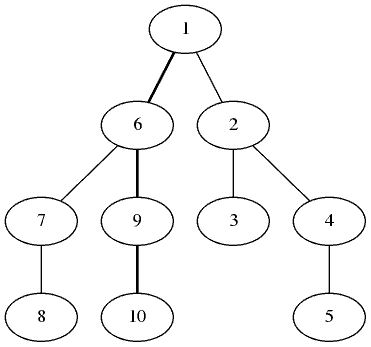 Here is a Binary tree of nodes we want to number. Through it we establish a "main" path / axis (not thread) extending to an arbitrary "final" leaf node at arbitrary depth. "is that left node on our 'main road' path? If so then instead first chose the right node, then the left node. If that left node is not on our path, then choose that left node, then the right node (no need to check if that right node is on our path now.) If there is only one node, choose it. If there are no children at all, then just stop this branch ('return()')." as I have done in the source code, which makes different trees on each run here on GNU/Linux. Now we have assigned all the numbers to all the nodes. Is our main road / path a "central path" / "axis"? In some respects no. It could be very short. But it must be at least one node long, else the final node won't be on it... In some respects yes. Nodes to the left and right of it are all numbered before it. Currently (2016) I haven't found such a traverse in the literature, so hereby name it "Zaokengian traversal." Maybe someone could write a open source GIS module that could take as input a network of roads, a starting and ending point, and would number all the future houses along them in the above fashion. Great for various housing estates, campgrounds, cemeteries, with forking non-grid streets. Now comes the task of how to find a particular numbered node starting from the root. First let's switch back to real life to see how a car driver is supposed to deal with it. "Left" and "right" are just labels. The traversal you describe is a pre-order depth-first traversal with the children relabeled so that all nodes in the main road are treated as "right". In real life we need to post one sign at the corner of each side road, "'← 170-211" etc. to tell drivers where that batch of numbers will "disappear" to. Supposedly a second sign "Main Road →" or "212… →" wouldn't be needed as it would obvious which was the main road, and drivers would be assumed to know to keep on driving up the main road if the side road sign doesn't mention the range they are looking for. The signs would be needed not only on our main road but also at (both sides of) junctions within our side roads. 連最小次路裡， 對面門牌仍是這面加減一。 So even on the smallest branch road, the number of a house across the street would be this house ± 1. Stretches of roads with no junctions would be represented simply by nodes with just one child (every 50 meters). Right or left child all OK. Perhaps use slight bends in the road to determine which, or just use one consistently. Perhaps any real four-corner (or more) junctions could be analyzed as two (or more) three-corner junctions, left first then right. 仍有四的考量… And then there are tetraphobia considerations to attend to, etc. Furthermore we had better be very sure to extend each road on our map to cover all future areas with the slightest chance of construction (to avoid running out of interstitial numbers and being forced to use e.g., "58-1" for a house "near" house 58. Our final goal would be to print out a map with each future house number location marked, similar to the plan B map below. Household Registration Office officials could refer to it whenever a new number was to be issued. We try a 50 meter per house number standard -- unlike the five meter one of cities. We also remove all house numbers ending 3's (3, 13, 523...) not only just the usual 4's, to keep the numbering of the two sides of the road balanced. Based on a formula we made an example query program in the source code. (We could instead alternatively remove 3, then 5, then 3... or even more complex "embarrassment hiding schemes."